Allium sativum, also known as Garlic, is a member of the Allium family. Its close relatives include the onion, shallot, leek and chives. and is technically neither an herb nor a spice. There are many varieties and they differ in size, pungency and color. The most widely used variety has a white/grey papery skin and pinkish-grey cloves and is grown in southern France. The bulbs found on sale are actually dried (in the sun), though we tend to consider them fresh. Garlic has many culinary uses. The cloves are separated, peeled and then used whole, or chopped or crushed. 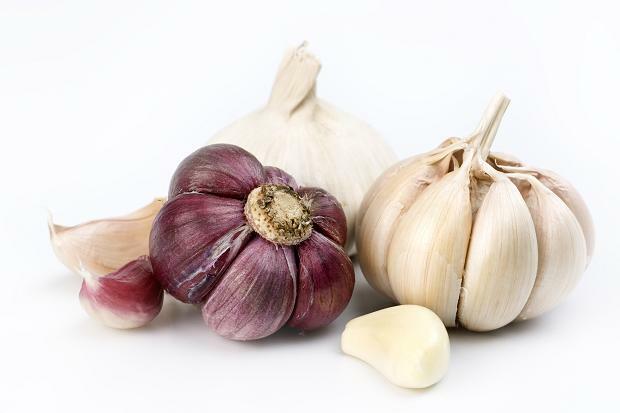 If the garlic is old, be sure to remove the bitter ‘germ’ from the centre of the clove. The easiest way to crush garlic is to place a clove on a board and, using the flat side of a small knife, press down firmly until you have squashed it to a pulp. Sprinkle a little salt on the clove to help the knife grip. Garlic crushers are fine, but some say that crushing the garlic this way gives it a bitter taste. The more finely the garlic is crushed, the stronger it will taste in the dish. When garlic cloves are cooked or baked whole, the flavor mellows into a sweet, almost nutty flavor. When cooking garlic, be very careful not to burn it. The flavor turns intensely bitter. more like garlic than onions. 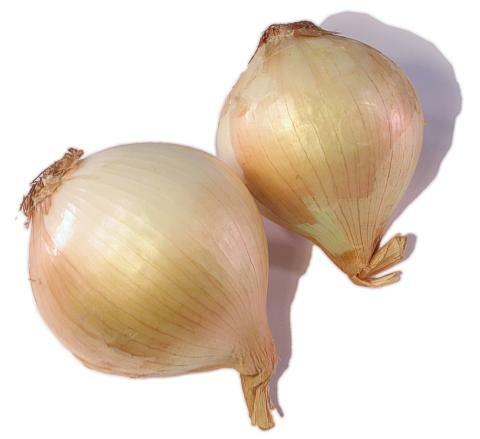 Shallots are favored for their mild onion flavor, and can be used in the same manner as onions. A shallot looks like a small, elongated onion with a copper, reddish, or gray skin. When peeled, shallots separate into cloves like garlic. "true" shallots which have a more subtle flavor. dry shallots (dry skin/moist flesh) are available year-round. Garlic and onions together, though the flavor will not be quite the same. The onion plant (Allium cepa) is unknown in the wild but has been grown and selectively bred in cultivation for at least 7,000 years. The unassuming brown, white or red, paper-thin skinned bulb has an intense flavor and is a beloved part of the cuisine of almost every region of the world. The word onion comes from the Latin word unio, which means "single," or "one". Named so because the onion plant produces a single bulb, unlike its cousin, the garlic, that produces many small bulbs. Also called Brown Onions, the Yellow Onion is best type of onion for caramelizing. Cooking it brings out a nutty, mellow, often sweet, quality. The longer you cook them, the more concentrated the sweetness. yellow onion and tend to be slightly sweeter and delicate in flavor. White Onions are an all-purpose onion. They are commonly used in white sauces, pasta salad, potato salad, and in Mexican and Southwestern cuisine. They tend to have a sharper and more pungent flavor than yellow onions. They also tend to be more tender and have a thinner, more papery skin. Cut the onions and allow to soak in water before adding to salads to reduce any harshness. Red Onions, also called Bermuda Onions and Purple onions contain less sugar than yellow or white onions. They do not work well for caramelizing, and the result will not be as sweet as with the yellow or white. Red onions are sometimes referred to as Spanish Onions, but this is incorrect. have a unique and appealing look. The "true" pearl onion differ from common onions by having only a single storage leaf, similar to garlic cloves. The pearl onions used in pickling are usually not "true" pearl onions, but common onions grown only to a very small size. Cippolini onions are used primarily in Italian cooking and cuisine. They can vary in color, but the most common one is the yellow Cippolini, it has a unique almost flattened shape. Other Cippolini onions are golden or bronzed and they have a very intense flavor, but less hotness. Green onions, also called scallions are the genus and species Allium fistulosum, unlike most onions, it stays small and does not form a large bulbs. Regular onions, Allium cepa may also occasionally be sold as a green onion or spring onion if it’s harvested, before the bulb fully forms. A sweet onion is a variety of onion that is not pungent. 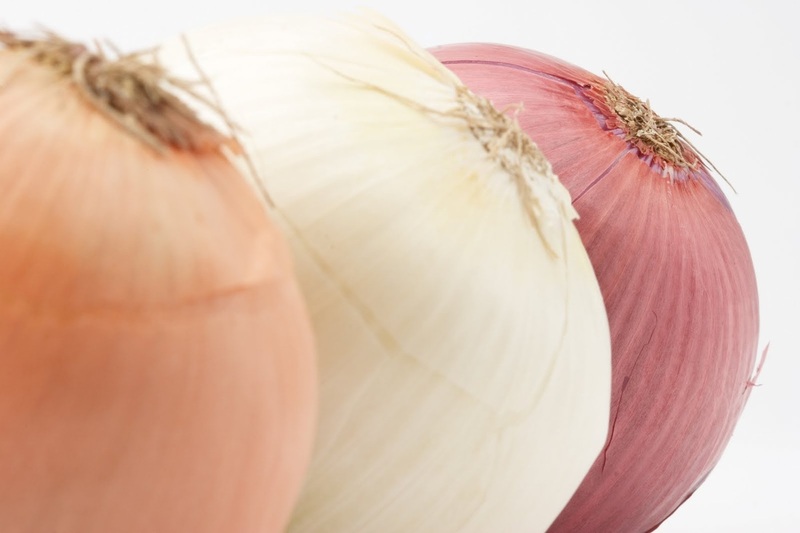 Their mildness is attributable to their low sulfur and high water content when compared to other onion varieties. The most popular varieties are listed to the right. To select your husband-to-be from among suitors, it is said that if the name of each suitor is written on an onion and then placed in a cool dark storeroom, the first onion that sprouts will be the man she should marry. Turkish legend has it that when Satan was cast out of heaven, garlic sprouted where he placed his left foot, an onion where he placed his right foot. An onion under the pillow is thought to fight off insomnia; and chewing a raw onion sterilizes the mouth and wards off colds and sore throat. The annual average per person onion consumption worldwide is about 13.7 pounds of onions. Libya has the highest consumption with an astounding 66.8 pounds. Onions grew in Chinese gardens as early as 5,000 years ago and they are referred to in some of the oldest writings from India. In ancient Egypt, the onion symbolized eternity because of its circle-within-a-circle structure. Paintings of onions appear on the inner walls of the pyramids and in the tombs of both the Old Kingdom and the New Kingdom. Look for firm, dry bulbs, free from sprouts. They should be well covered with a papery skin and no sign or wrinkling or sprouting. Avoid soft bulbs or ones that have a sharp odor before peeling. Store in a cool, dry, well-ventilated place for a month or more. Once peeled, refrigerate in an airtight container for a few days.